On writer Molly Young’s ﬁrst date with graphic designer and director Teddy Blanks, they hung out on her rooftop in Chinatown. “We went to my apartment and I forced him to play the piano while I lay on the ﬂoor and listened. I remember that I really liked the way he smelled,” says the New York Times Magazine contributor, who also creates crossword puzzles for the paper. “That morning,” says Young, “I washed my hair and hoped for the best.” A makeup artist she found on Instagram gave her a coppery smoky eye. (“I wanted to do insane raccoon glitter, but she said no.”) Young paired pink pom-pom kitten heels with a custom white pantsuit inspired by Bianca Jagger; Blanks wore a Perry Ellis crossword puzzle tie scored on eBay. After taking a number and waiting in line, the couple was eventually ushered—along with their parents and childhood friends—into a room. “The whole thing took 80 seconds,” says Young. 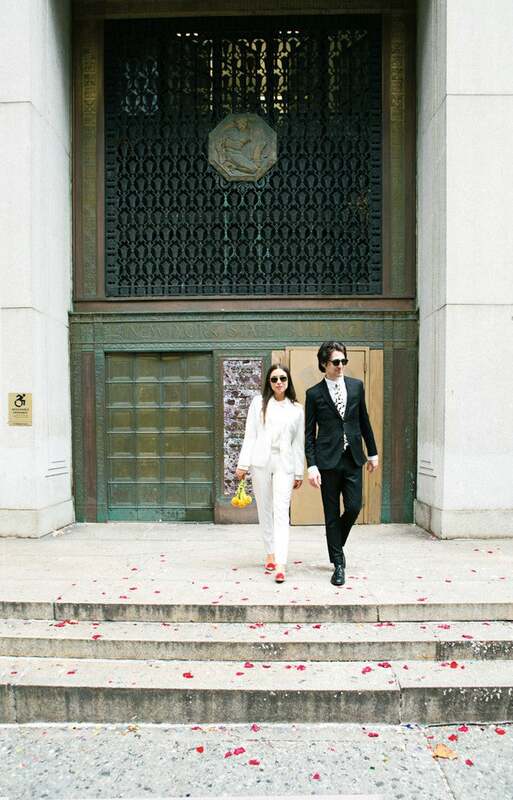 Her leopard-print enamel wedding ring was equally easy: “I got it from the Real Real for $100.” After pics were snapped on the stairs outside the Marriage Bureau, which were “covered in confetti from previous weddings,” the newlyweds strolled to the Odeon Restaurant. The next day, Young prepped for the post-wedding celebration, hosted in their apartment. “My brother brought over 30 cases of fancy beer that we put on ice,” she says. A bartender, whom they found on Yelp, made signature drinks like bourbon mint juleps (a nod to Blanks’s Southern roots). Blanks put together a playlist, with Prince, Otis Redding, and Zapp & Roger in heavy rotation. When it comes to a big party, a self-serve bar is the way to go once the bartender packs up. Picking up on a canary-hued side table, the bright yellow paper plates and vintage bowls create a strong color theme. Young concealed unsightly extension cords with plastic ivy. This story originally appeared in the Winter 2017 issue with the headline The Cool Girl’s Guide to a City Hall Wedding (in 3 Easy Parts).